"The aim of the show is to create an immersive experience, providing an effective key to interpret the age-old history of the city of Rome. Videoprojection is at the centre of this major project." 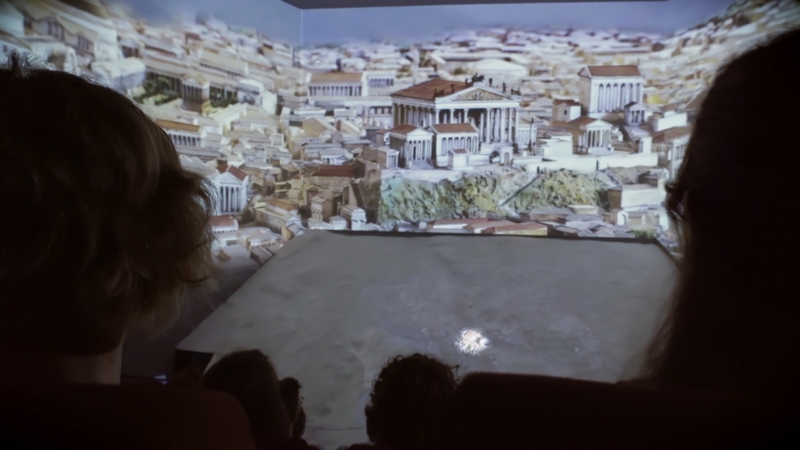 Location – Using immersive projection to reconstruct a journey through time in the city of Rome. 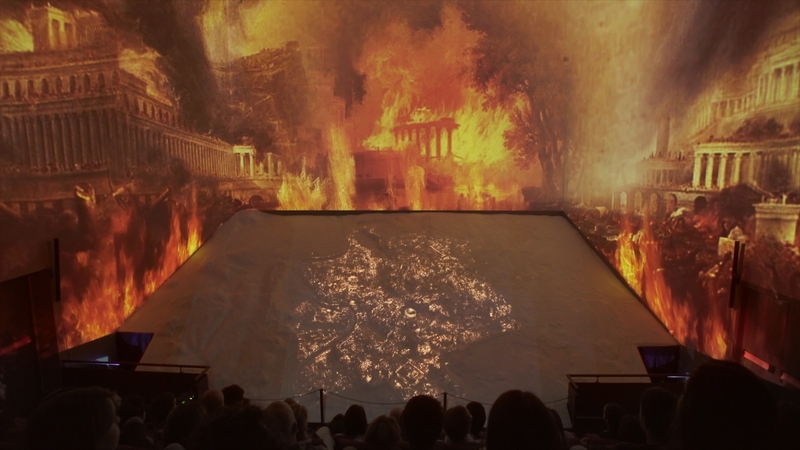 Using immersive projection to reconstruct a journey through time in the city of Rome. To use 15 Panasonic PT-RZ570W projectors, for their ease of installation, level of brightness and reliability. 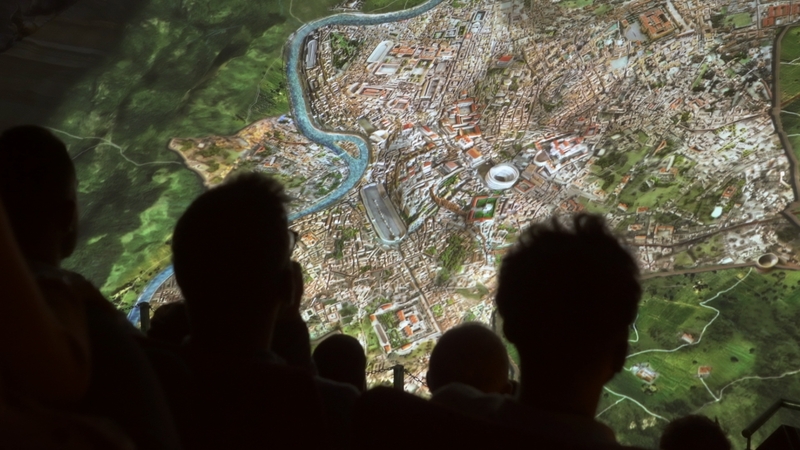 Welcome to Rome, conceived by Paco Lanciano a Physicist and scientific communicator, is a multimedia space designed and installed to tell the age-old story of the Eternal City in just 30 minutes, for tourists and Roman citizens. 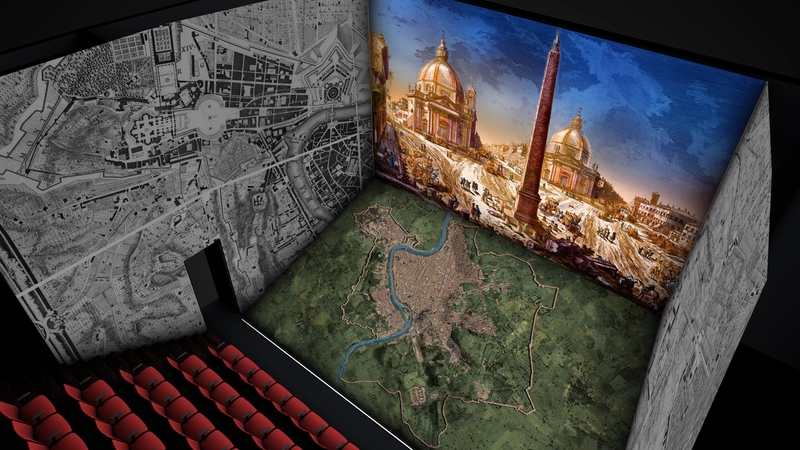 Located in the centre of Rome, in the former Cinema Augustus, it has been completely restructured to accommodate a journey using immersive video projection and an innovative audio solution, synchronised with the images. The main 80-seat hall has 10 Panasonic PT-RZ570W videoprojectors and a large sculptural relief, some 35m2 on the floor, devoted to the city of Rome. This is a total edge blending solution, ensuring an experience which arouses strong emotions from the intense immersive effect of its content. The objective of Welcome to Rome is to provide the visitor with a historical framework to the city, guiding them through from its foundations to the present day and using high quality projection. "The idea, achieved for the first time in Italy is realised through this major, integral and sophisticated installation, tells the story and development of the city of Rome,” comments Paco Lanciano. The narration guides the audience through this immersive experience, through story-telling and image as the historical account unfolds." 'Welcome to Rome' aims to provide an emotional experience, whilst teaching and entertaining at the same time. It is a rapid, efficient means to communicate, in line with our fast-moving daily lives. The sequence of historical periods unrolls in a timely, accurate flow, without lingering too long; this is a format which suits both tourists and also gives Romans themselves a chance to reconsider the crucial stages in their own city’s history. The experience space has five different areas, a large main hall and four smaller rooms, designed to act as antechambers to relieve the flow of visitors to the main cinema hall. The smaller rooms are devoted to more thorough examination of some particular points in the history. In total, there are 15 Panasonic PT-RZ570W Solid Shine laser projectors installed in the five areas. The main hall is a cinema and seats 80 people using ten PT-RZ570Ws projectors, with a 35 m2 sculptural relief of Rome. The multi-projection system is aimed at five different surfaces: two side walls, the floor, ceiling and onto the sculpture, literally surrounding the audience. "For the audience we have placed the seats as close as possible to the screen, using the typical layout of IMAX cinemas," emphasises Paco Lanciano. “The projected images are all gathered from real resources, portraits and paintings, architectural features. We have not used computer graphics or virtual imaging: we preferred to offer a realistic portrait of the city, to respect the narrative truth of the story." 30 minutes. Welcome to Rome provides an instant overview, giving the visitor a better experience of the city. Projection on sculpture. An example of video-mapping on the floor. "The Panasonic video projectors allowed us to eliminate some significant critical points during the planning stage, because they are so compact and easy to handle," explains Luca Altobelli of BitCodeLab, who designed and supervised the installation. “For instance, when installing the projection system in the main hall, we had no problems with fitting the equipment in angled and/or vertical positions. The PT-RZ570W is a fixed-lens projector, which is well-suited to the Welcome to Rome environment. "The museum is managed entirely by Remu 2,” notes Luca Altobelli. “A guide-software package developed with my colleagues Francesco Antoniella and Francesco Venturini." Remu 2 controls video, audio, lighting and the Remupersonal devices which every visitor receives when entering, to interact with the stations along the route and listen to the audio clips in their own language. This guide-software manages the presentations at the individual ‘islands’ with a single interface. "Using a network of sensors, the Remupersonal identifies the visitor’s position and transfers the data to the central controller, in order to route the content recording automatically," finishes Luca Altobelli." "Lights are managed with DMX dimmers, from the videoprojectors. The Remu system also manages visitor groups, so for instance enabling school groups or organised tours to be better coordinated." The Panasonic Solid Shine projectors use laser technology: The light source has an operating life of 20,000 hours (so there is no need to change a lamp) and the air filter is maintenance-free as well. Welcome to Rome has been designed as a permanent multimedia show, with a projected life of 10 years. So the technology installed has been carefully chosen. Edge Blending. The floor projection contributes to providing a 3D display.